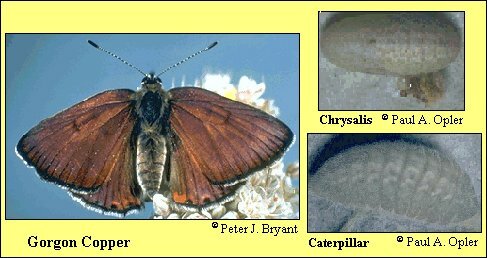 Identification: Upperside of male coppery brown with bright reddish purple tinge; female dark brown with cream and black spots. Upperside of female hindwing with row of orange crescents next to row of small back spots. Underside of both sexes gray with black spots; hindwing with submarginal row of red-orange spots. Life history: Males perch and patrol for females near host plants. Eggs are laid singly on host flower stalks and hatch the next spring. Caterpillars eat leaves. Flight: One flight from May-June. Caterpillar hosts: Plants in the buckwheat family (Polygonaceae) including Eriogonum species. Habitat: Sage scrub, chaparral, foothill woodland, rocky hills and outcrops. Range: Southern Oregon through California to Baja California. Conservation: Not usually required. Some colonies lost to development and others degraded from effects of exotic grasses and other weeds.